Pantelis was born in 1962 at Heraklion Crete. He studied Business Administration at University of Piraeus and Computer Science at Brooklyn College, in New York. 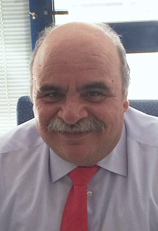 He is the founder of FORTHnet SA, starting from the Institute of Computer Science FORTH (FORTH) in 1987, where he undertook the conversion of the research activity in company, attracting investment capital from Greece and abroad. He was CEO of Forthnet since its inception (1995) until 2011. Forthnet group today is listed in ASE and is the biggest fixed alternative telecommunication and PayTv operator in Greece. Since 2008 to 2011 he served as Chairman and CEO of a satellite PayTV platform NOVA. Since 2007 to 2011 he was elected as Chairman of the Board SEPE (Federation of Information's & Communications Companies in Greece). Since 2006 to 2009, he served as Member of the Supervisory Board of NETIA SA, the largest alternative telecommunications operator in Poland. In 2011, he was appointed as special Advisor to the Prime Minister for Technologies, Information's and Communications, while from June 2011 until May 2012 he served as Deputy Minister for EGOV in the Ministry of Administrative Reform and e-Governance. Since September 2012 until May 2013 he took the coordination for the development of innovation and public procurement in the Ministry of Development, Infrastructure, Transport and Networks. Since June he is a Member of the Board of Directors of Quest Holdings SA, the biggest Technology and Integration group in Greece.